Have you ever had an interest in making high performance knives, tomahawks or to forge damascus steel? Or maybe learning to engrave or carve steel, wood or ivory? Classes offered in my comfortable 4400 sq. foot wokshop I have assembled a wide variety of equipment for you to learn and try your hand. My classes offer students the opportunity to explore and develop their skills. With a maximum of only four to six students per class, a hands-on approach ensures that everyone receives the personal attention they need. My wife and I are welcome you into my home and shop. The skills that need to be mastered are not out of reach and we are here to make this happen. Courses include all the materials and attention you will need to develop you skills, including good food and I hope a good time that you will remember. You will learn a few things and improve your skills. Each class covers a lot of information, but please bring your questions as the format of the the class is flexible to suite the interests of the group. Please feel free to contact me if I can answer any questions. I hope to see you and wish you the best in your learning experience. The following courses are offered at various times during the year and can be scheduled and customized for your group. This 2-day course is designed for anyone with little or no forging experience but an interest in making hand forged high performance knife blades. Topics to be covered include blade function and design, selection of steel, forging and safety. All students will gain a basic understanding of the techniques and importance of forging a blade to shape at low temperature and have hands-on experience using a gas forge. Techniques of differential heat treatment and its importance will also be discussed. This class is dedicated to the forging and heat treating of a blade in preparation to the making of a complete hand-forged knife. This 5-day course is designed for anyone with some basic knowledge of forging and is interested in making a hand forged high performance knife from start to finish. Topics to be covered include blade function and design, selection of steel, forging, grinding, heat treatment, handles, guards and bolsters, silver soldering and safety. All students will gain knowledge and a basic understanding of the techniques. The importance of forging a blade to shape at low temperature will be stressed. Techniques of differential heat treatment and its importance will also be covered. Gain hands-on experience using a gas forge, and to take full advantage of hand and power tools. All students will make a knife from start to finish. This course is designed for those with a some experience of forging and is interested in learning to make damascus steel patterns. 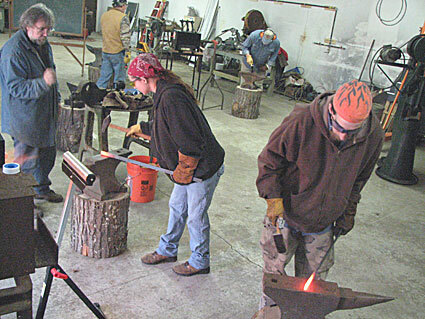 Students will learn how to forge weld a billet and the proper use of temperature and flux. Topics to be covered include basic patterns, acid etching, steel compatibility, pattern variation and manipulation. Forging a blade to shape and its importance will also be covered. For those with some forging experience and an interest in learning to forge a tomahawk head. We Will discuss design and function of various types of tomahawks. This course will cover the various methods of making a hawk including traditional and more modern methods. All students will complete a tomahawk head that they can take home to complete the haft. Want to get started in metal engraving. This is a 2 day course that will give you the basic concepts needed to get started, with lots of bench time to practice. We will us a combination of GRS Engraving Systems and hand push gravers. We will not use practice plates. You will learn to do your own layout work learning basic scrolls and borders. You will also learn to sharpen and control you tools as you cut your design in steel. In this course students will learn how to design and make a liner-lock folder with easy step by step instructions. We will also cover the contruction of all types of folders including lockback, frictions folders and slip joints. This class is designed for a person with some experience in knifemaking. We will cover all aspects of knife grinding including convex, hollow and flat grinds. This course is good hands-on experience for knifemakers who use either the stock removal of forged methods of knife making. This course combines my Blade Forging and Grinding courses. Day 1 will cover forging basics. Each student will forge a blade to shape and then grind to your own preference, either (hollow, flat or convex grind). On day 2 we will heat-treat in the morning. While the blade is in tempering cycle we will practice forging out additional blades. This is a good intro course. Everyone will go home with a blade ready for a handle. For those with no previous carving experience. This course will cover design and layout. Will discus choosing the proper tools used in the carving of bone, ivory and steel. Both hand and power tools will be used. Each student will carve a simple geometrical design in bone and develop that into the more complex. A discussion on how the techniques learned in geometric designs will be utilized when the student later advances to carving wild life and other figures. Bring your notebook and saftey googles if you have them. And feel free to bring your questions and any work you have in progress that you may want to help with. My shop is located 4 miles east of the Taconic Parkway Route 199 exit. The Taconic is a beautiful parkway but please watch your speed limit. The small towns around here are serious about speed limits. If you are coming by train we could pick you up at Amtrak's Rhinebeck train station.